1. Vocabulary List – kid fills in the English translation of the Chinese vocabulary words. 2. 识读字 – The kids are supposed to know how to read these words. If they know how to read, then they should know how to write the Hanyu Pinyin for them. So for this test list, the kid is supposed to write out the Hanyu Pinyin for the characters. If these came too late for SA1 this year for you, you can still use them for SA2 revision at the end of the year. 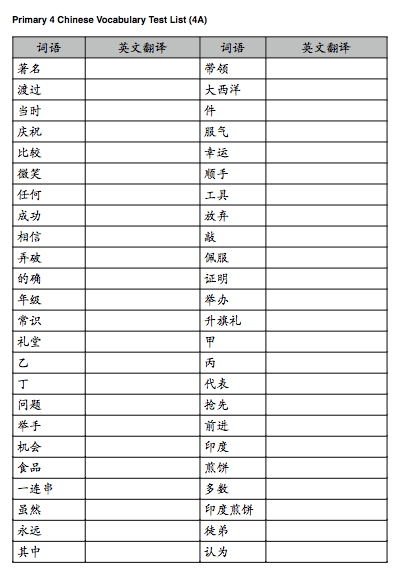 However, do take note that the lists are based on the normal Chinese textbooks, not the Higher Mother Tongue textbooks. For answers, please refer to the textbooks. The vocabulary table is at the end of the textbooks. The Hanyu Pinyin of the 识读字 can be found in the individual lessons. However, the entire list (without the Hanyu Pinyin) can also be found at the end of the textbooks. To do reasonably well for the first few sections of the exam paper, the child should try to learn how to read all the识读字, he should know how to write all the 识写字 (all of which can also be found at the end of the textbooks), and he should know all the meanings of the vocabulary words found at the end of the textbooks. Take note that the Ministry of Education reviews the syllabus and textbooks every few years, so these lists are only relevant until the next change. If you found this post after 2014, please double check with the current syllabus. Hi do you happen to have the vocabular lists for P2 and P3 as well? Hi, I have just made available the list for current year P3. The P2s & P1s are using a different syllabus and I do not have their books to create the lists. May I have the link to the P3 list please?